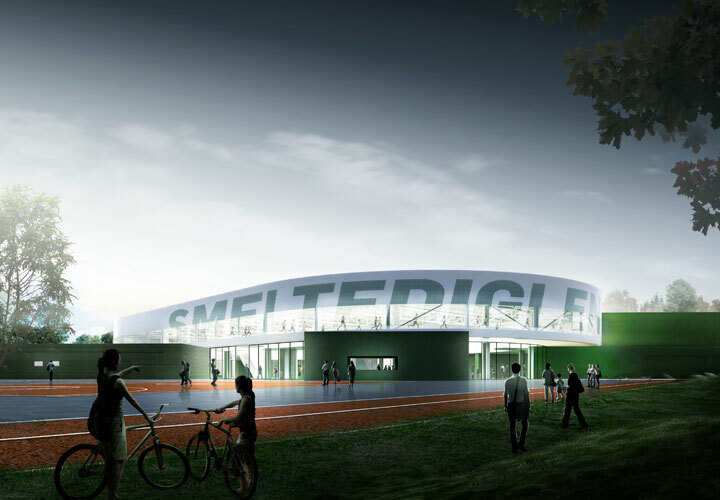 “The Melting Pot” is our proposal for the new Langvang multi-purpose sports hall and outdoor activity park. 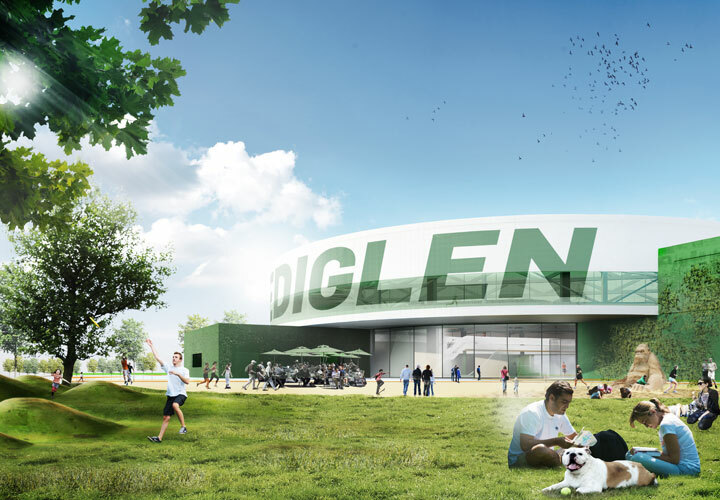 On the one hand, the idea is about bringing together a variety of activities in one highly versatile sports building in connection with the surrounding landscape. 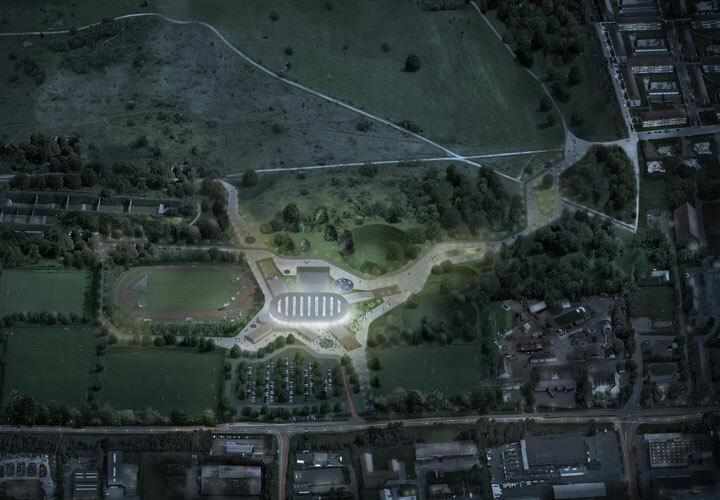 On the other hand, the project is about bringing together a diverse group of people, offering spaces for social and sports activities to all on their own terms. Therefore, the Melting Pot is designed to reach far beyond the building’s physical context and to become the focal point for new social relations in order to strengthen the sense of local community. 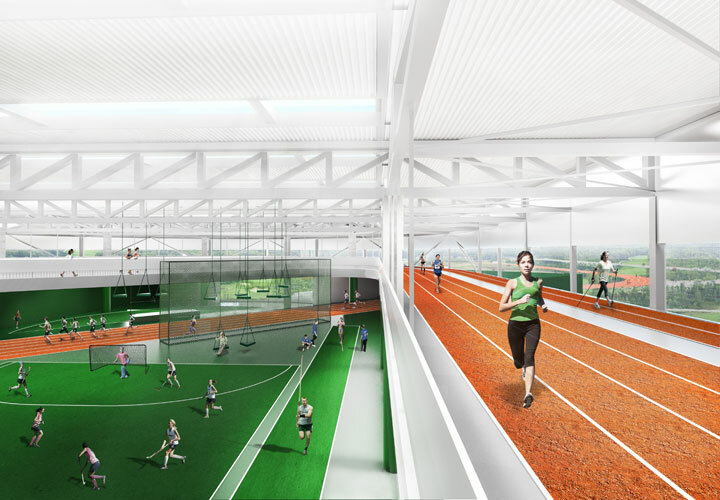 The concept is based on the program’s most significant activity, the 200m running track. The track is lifted above the existing building to the first floor level so that it becomes visible from afar and conversely grants generous views over the city and nature areas. This distinctive placement adds an almost iconic importance to the track as it signals sports and activity while at the same time providing a both visual and physical anchor for all additional – known as well as possible future – functions. 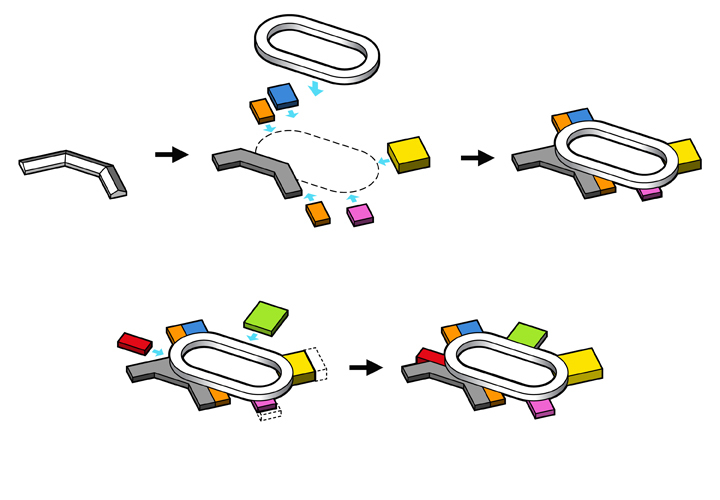 This hovering expression allows for a flexible plug-in strategy, where new programs can be added and “pushed” in beneath the track’s geometry. 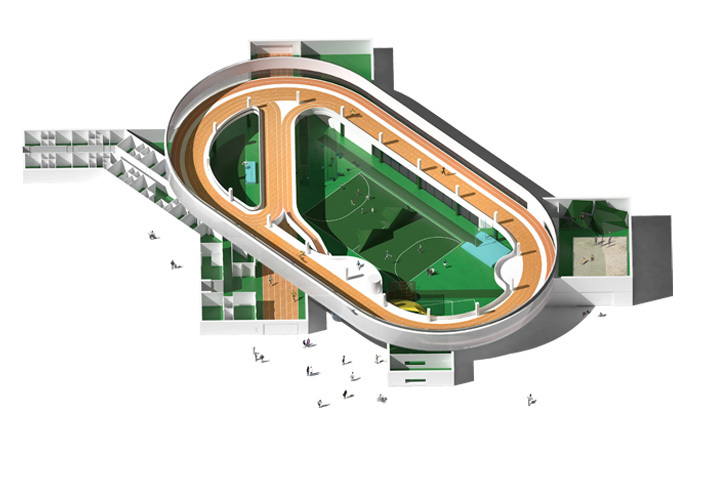 The track’s oval shape shall be experienced as permanent and continuous while other volumes, functions and activities can be expanded or plugged to the building in the future as needs evolve and financing is raised. 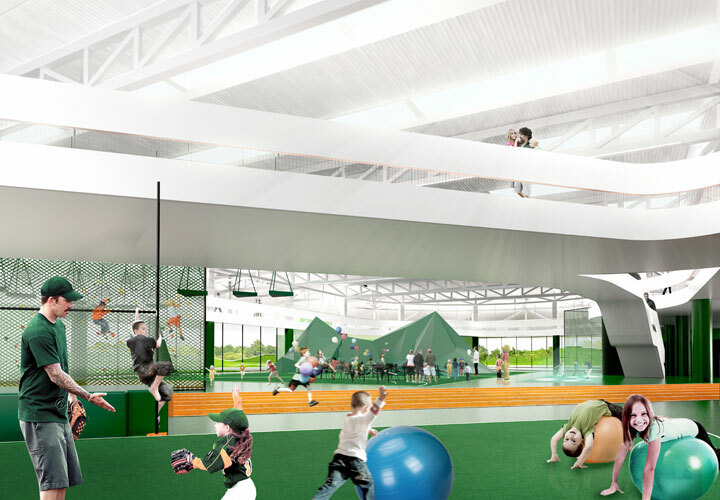 This strategy creates varying spaces with distinguished spatial qualities for both sports and social activities. The design strategy results in an irregular, jagged façade line with high degree of contact between inside and outside with niches and corners for both roofed and open-air outdoor activities. The programming was executed in a constant interplay between interior and exterior that follows a simple but strong logic in order to achieve optimal synergies across the entire Langvang complex. 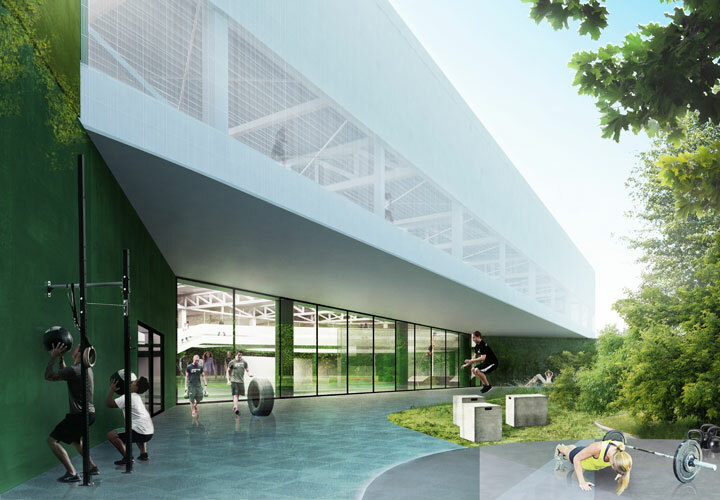 The outdoor areas nearest to the building mirror the interior activities and create a gradual transition between the hall and its context – the city to the west and the nature area and activity park to the east.